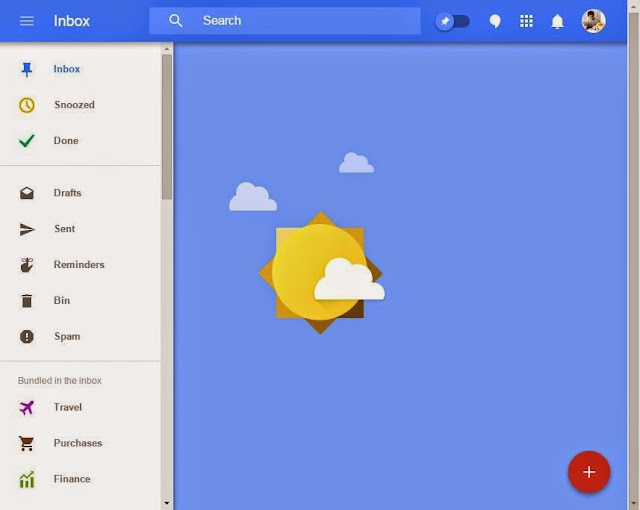 Inbox by Gmail - New App To Do with E-mail | Live to Learn! Interface revamp is happening everywhere. Recent mobile operating system Google Android L (Lollipop) has revamped its interface and every Google App receiving update with material design. By the way Google has released 'Inbox by Gmail' mobile app & web app. Now you can interact with your e-mails more efficiently and never miss any important tasks. This "Inbox by Gmail" app neatly organize and bundle your e-mail messages by it's type. - You can schedule any e-mail to read or review later with "Snooze" button. - You can create 'Scheduled Task' directly from E-mail with single touch / click. - You can add to archieve all mails in a bundle with single swipe. All mails are just like To-do items. Instead of 'Archieving', Mark as 'Done' can be used. 'Move to Inbox' is known as "Pin to Inbox", so pinned mails are in Inbox. It is now "Invite Only". i.e., you must have an invite to get this.